The Office Commons offers the highest quality professional business services in a convenient office setting that's cost effective and hassle-free. Our business equipment is state-of-the-art as well so that our tenants can take advantage of the finest communication technology and business resources available anywhere. Housed in The PDC Building. Services Available: All service rates are below market rates. Digital Terminal Phone Instrument tied into Receptionist desk. Voice Mail Service which enables you to pick up your messages at any time during or after business hours. High Speed Internet Access available to tenants at a nominal charge. Word Processing/Typing Service - Microsoft®Word 2000. Enhanced Word Processing, Excel, Publisher and PowerPoint. 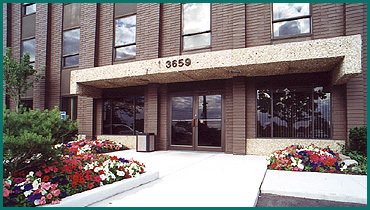 Administrative Services A member of our staff can assist you with filing, miscellaneous services, light typing, etc. Copy Service with automatic feed, collating, and duplexing capabilities. Postage metered daily, plus 15%. Your mail is delivered daily to your office and outgoing mail is metered and deposited in the U.S. Postal station every afternoon at 5:00. Daily Courier Services provided, courier of your choice. Conference Room is available on a limited basis. Reservation by appointment. Tenant allotted 6 sessions per month, additional sessions extra. The Office Commons features a snack bar/coffee shop on the premises for eat-in or take out orders. In addition, the building offers an onsite executive car wash service. The building is exceptionally well maintained with newly renovated front and rear lobbies.